The ASUS F554LA-WS71 is mid-range notebook most suited for users needing the laptop at home as a desktop replacement device since it’s packed with backward compatible technology and decent enough hardware to actually replace a stationary PC for most everyday activities. With a simple and straightforward design, the ASUS F554LA comes with a dual core Intel i7-5500U processor with 4MB of cache, enough to run everyday programs and webpages with ease. It will also handle multitasking jobs very well, enabling you to be more productive and save precious time. It also has 8 gigabytes of installed system memory that’s not user replaceable, but the amount is sufficient to not be outdated in the next couple of years, guaranteeing a smooth user experience for longer periods of time. The storage space is also in abundance: 1 terabyte will be enough for all your files and audio/video collections, although we recommend investing in a solid state drive to replace the 5400 rpm hard disk. The mechanical drive that currently outfits the ASUS is slowing it down considerably by comparison with its other specs. The screen is a bit of a downer, since you won’t be getting a full HD display; instead ASUS opted for a 1366 x 768 resolution. The quality won’t be as impressive as other laptops have to offer, but since we’re considering it to be mainly a desktop replacement, this shouldn’t be a deterrence in choosing it over other competitors. 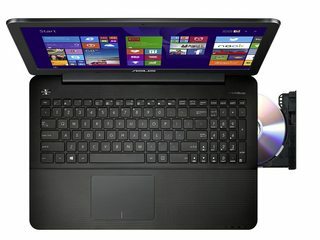 Furthermore, it’s great because it’s backward compatible and can act as a bridge between a user’s old system and a more technologically advanced piece of equipment, such as the ASUS F554LA-WS71. It comes with a VGA output port (great if you have a non-HDMI compliant monitor), has a DVD writer, a piece of hardware that’s increasingly more rare these days due to an arms race towards lower weighing and more thin devices and an RJ-45 port for wired Gigabit LAN connections. Thus, the battery life is modest: it will output up to 5 hours of regular usage before shutting down. It’s enough to move around in your home or around the office, but I wouldn’t take it on vacation or on a business trip with me since it’s also on the heavy side, weighing 4.9 pounds without the power adapter and cable. The ASUS features the IceCool technology, which lowers temperatures around the area where the palms usually rest when typing and using the trackpad so it can be used without getting sweaty palms. It also comes with a 1-year accidental damage international warranty, which is a great deal! 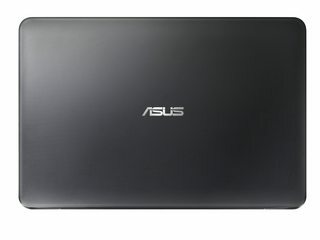 The ASUS F554LA-WS71 is a good alternative for any desktop if you’re planning to use the laptop on a day to day basis around the house or even the office. It won’t play the most recent of games, it won’t render graphics fast enough and may not handle heavy loads with ease, but it will provide a reliable user experience in 99% of the times it will be used. And considering the relative low price point for the performance, I’d say the ASUS is a good deal to consider.